Prefold diapers have been around for many, many years. Long before the revival of cloth diaper use thanks to modern cloth diapers. Prefold diapers are similar to flat diapers in their affordability and durability. Prefolds are what your mother or grandmother may have used to cloth diaper her children. 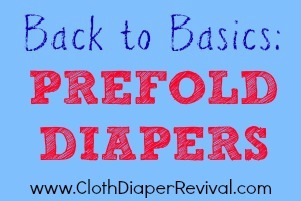 If you are using a diaper service, you will most likely be using prefold diapers. They are easy to use and care for and a very cost effective way to diaper your baby. Prefold diapers are rectangular layers of fabric sewn together in thirds. The middle has more layers than the two sides. Prefolds can come in sized or one-size. They can be made from many different fabrics including cotton (Birdseye or Indian), hemp, or terry. With cotton prefolds you can find either bleached or unbleached cotton. Chinese prefolds are simply prefolds that are made in China. To use a prefold diaper, you can either fold the diaper using a diaper fold secured with a Snappi or diaper pin. My favorite, and the easiest way to use a prefold is to fold it in thirds and lay it inside a cover. Prefold diapers do not contain a waterproof outer layer, so you will need sometime of waterproof diaper cover.